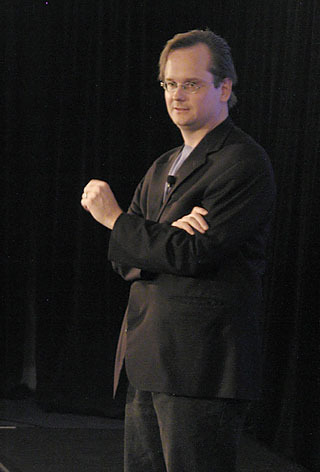 When I read that call to action, I resolved to take up Lessig's Challenge. I would donate more money to people and organizations fighting against the media monopoly than I spent buying the monopoly's products. I would support organizations like the EFF, Digital Consumer, the Free Software Foundation, and the ACLU that fight for cyber-liberties and free speech. I would buy items from independent artists online and in person. I would donate money to open source programmers who are fighting the good fight. This page will chronicle how I did month-to-month and who I donated my money to. You can join me in taking up Lessig's Challenge. Email me and I'll link to your challenge page from this one. If we get enough interest, we can even start a weblog. Will you take Lessig's Challenge? David Nedrow writes to say that I should mention that EFF and FSF are 501(c)3 tax-exempt organizations: "Employees of companies with United Way plans can also request that EFF or FSF receive all or part of a United Way contribution. The cool part about this is when the employer matches employee contributions. Double your contribution for free!" More details. Don't have any money? That's OK. Donate some volunteer time towards open content (free music, movies, comics, or software) or help out with one of the organizations. Paul Curry also wrote in with a great suggestion: ask for charitable contributions as holiday gifts (Paul recommends you check out Book Thing, which provides free books to those that need them). Need some ideas about who to donate to? Check out my list of suggested recipients. I split the cable modem with my roommate, so we'll just call my monthly entertainment industry expenditures $50. That's the sum to beat every month. Note: I don't include books in my total because the publishing industry isn't as egregious as the MPAA and RIAA (and it would probably put me in the poorhouse if I did). October Radio K, local college radio station which plays tons of indie and local music. $120 ($10/month for the next 12 months). Supposedly received a t-shirt, but I never picked it up. I'm not totally sure when I committed to this donation. November Sam Brown, Exploding Dog. Paid $65 for an Exploding Dog print. December Free Software Foundation. $120 for Associate Membership (member #78). Will receive a copy of Free Software, Free Society. Donated $50 to the American Civil Liberties Union to become a "card-carrying" member. Received an FBI probe for aiding the terrorists. January 2003 $50 donation to Eufio for their recording fundraiser. Received executive producer credit (see the movie State and Main) and a copy of their EP when it's released. February $30 to keep Salon in business. What can I say, I like Salon. Note: When I purchase something, I do not include shipping and handling in the price on the theory that the creator does not keep this money.